Home Agency Executive Government Judiciary Legislative News PRC Amendments to the Revised Guidelines on the CPD Program for all Registered and Licensed Professionals. Amendments to the Revised Guidelines on the CPD Program for all Registered and Licensed Professionals. Resolution No. 2016-990 Series of 2016. 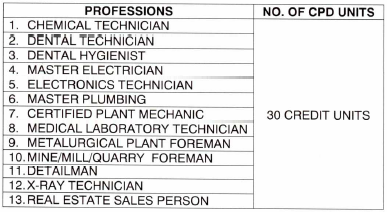 Section 19 of Section 5: CPD Credited Units – Registered and licensed professionals shall complete the required units every three (3) years as specified in Annex “A” (Credited Units Required per Professional) or as specified in their Professional Regulatory Law or as provided by the PRB and the Commission that may be issued. 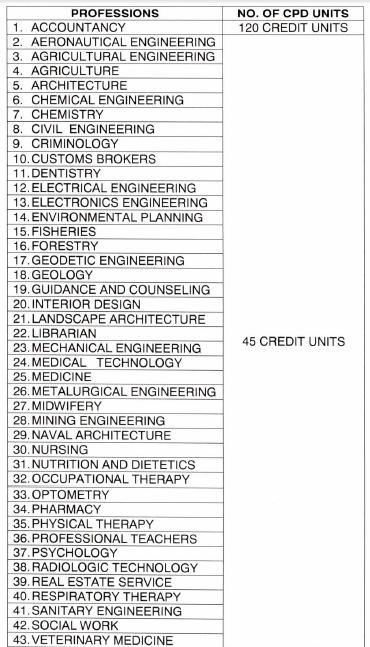 ANNEX "A": Matrix of Credit Units Required per Profession every three (3) years.